"Extremely well organised, high quality, friendly, supportive, exciting, motivating, dynamic and caring throughout the two weeks. Every single child mattered to them and you could feel the love radiating from both sides." 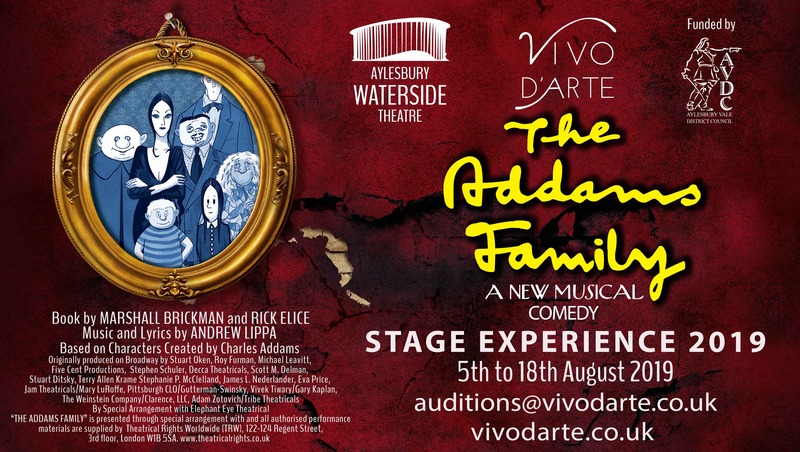 Aylesbury Waterside Theatre, in partnership with Vivo D’Arte, return for our third Stage Experience for young people aged 8 to 25 this August with “The Addams Family” following the five-star reviewed production of Whistle Down the Wind last summer and Oliver! in 2017. Supported by Aylesbury Vale District Council this exciting production of The Addams Family. Wednesday Addams, the ultimate princess of darkness, is all grown up and has a shocking secret that only Gomez knows. She's fallen in love with a sweet young man from a respectable family. With his cherished Morticia in the dark will Gomez manage to keep his daughter’s secret until the two families meet for a fateful dinner with hilarious consequences? Join them, plus Uncle Fester, Lurch, Pugsley and more for a heart-warming story of love, family and friendship… with a twist! Featuring a live orchestra and extraordinary original score by Andrew Lippa, THE ADDAMS FAMILY is sure to entertain whether you are 7 or 107! The cast of local performers will get their time to shine performing the many stunning songs, superbly choreographed dance and with live orchestra creating a spectacular musical theatre production on our prestigious main stage this summer. Auditions will take place on 3rd and 10th March. To apply for an audition please click here to complete this form. You can find out more about The Addams Family Stage Experience by visiting our Information Page. Read our survey results following Whistle Down the Wind Stage Experience 2018 clicking here.